The Whitsundays is a tropical destination that dreams are made of offering a chain of 74 islands on the doorstep of the Great Barrier Reef. Renowned for its aquatic adventures and natural beauty, The Whitsundays were made for sailing with hundreds of secluded bays and coral reefs to be explored. Discover magical sea life and coral reefs above and below the water’s surface on sailing cruises, jet-ski adventure and jaunts to Whitehaven Beach. You’ll never run out of activities to keep you occupied. Choose your dream Whitsunday holiday with our inspiring list of things to do. The Whitsundays region is filled with so much beauty, it is a definite must-see when in the area. But forget about all of the luxury resorts and romantic getaways, this is the perfect place for the kids! The popular islands such as Daydream and Hamilton are havens for the little ones with so many activities on offer they will be so busy, they’ll forget to sleep. We break down what we feel are some of the best – and best value – attractions in the Whitsundays region the young ones will love! If you are lucky enough to be in the Whitsundays during whale migration season between June and October, you must not pass up the opportunity to see these amazing creatures up close. This is an experience of a life time that your children will always treasure! Jump aboard the 8 to 12 person vessels as they make their way out to see the playful whales jumping and splashing in the waters around the boats. "These beautiful humpback whales are just as curious as you and boy do they put on a show!" There are multiple tours that travel out during whale season, some involve trips to other parts of the reef including Whitehaven Beach on Whitsunday Island. If you choose to take part in this duel cruise, you will be transported to one of the most iconic beaches in the world while enjoying a barbecue lunch on board. Tours run from June 20th to September 30th and depart daily during at 10am from the Port of Airlie Marina for the full day tour and from 8am and 1pm for the half day tours. Hamilton Island’s animal sanctuary is a must-see when in the area. 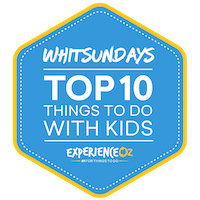 Perfect for the young ones who love getting up close and personal with animals, especially some of Australia’s most iconic wildlife. Right on the island, you can take a guided tour of the sanctuary to see a range of marsupials, snakes, lizards, koalas and kangaroos. You will also get to see the island’s resident crocodile and even cuddle a koala! Visitors can also follow the wild life schedule throughout the day. Tours include breakfast with the koalas, a wombat encounter and photo, a dingo encounter and park tour. "Right on the island, you can take a guided tour of the sanctuary to see a range of marsupials, snakes, lizards, koalas and kangaroos. You will also get to see the island’s resident crocodile and even cuddle a koala!" After you’ve toured WILD LIFE you can have some refreshments with some cute, friendly koalas at the Koala Cafe. Once you’ve paid entry into the sanctuary you will have an unlimited entry pass for the remainder of your stay on Hamilton Island. WILD LIFE is open every day from 8:30am to 5pm. Daydream Island is home to one of the world’s largest man made reefs! The Living Reef is home to over 140 species of fish and 83 coral species. As part of the Stingray Splash package visitors over the age of six can meet one of the island’s baby stingrays, Spud. You will be led around the reef by an expert marine biologist who will answer all of your questions and teach you interesting facts about the intriguing creatures that call the reef home. "You will be led around the reef by an expert marine biologist who will answer all of your questions and teach you interesting facts about the intriguing creatures that call the reef home." The Guided Fish Feed is another great hands on experience the kids will love! The brave ones can pat a reef shark and feed some barramundi, get snapped holding a large sea star and sea cucumber and even feed Pancake and Pikelet, the island’s big stingrays! For safety reasons, the curious and friendly rays have been de-barbed. Daydream Island Resort is currently closed for refurbishment and will re-open in 2019 with a massive 1.5 million litre water tank featuring a free form coral lagoon. Guests will be able to join marine biologists to watch baby stingrays be fed and ask questions about the 100's of species including starfish, stingrays, sea cucumbers and crabs. Feel like a pirate as you sail the high seas in a historic tall ship from 1946. Sail around the Great Barrier Reef stopping at snorkelling sites that aren’t very popular, but are filled with beauty. The tall ship will dock at Bali Hai and Langford Island for the on board passengers to disembark, jump in the clear blue waters and explore the reef. "This is a unique way to experience the Great Barrier Reef without the crowds at quiet and pristine reef sites and on board a historic tallship." The young pirates will be issued a special tall ship certificate for their service on board, making them an official sailor of the high seas. Morning tea and afternoon tea is supplied as well as a fresh smorgasbord lunch and refreshments. All pirates big and small are welcome to board the ship and experience the reef on this unique experience. Pristine waters and the Great Barrier Reef is not the only thing that the Whitsundays is famous for. The Proserpine River near Airlie Beach is the most highly populated rivers in Australia full of salt water crocodiles and you can see them up close (safely) on a Whitsunday Crocodile Safari. The safari is an opportunity not just to see the prehistoric giants but also you will see an assortment of wildlife including various birdlife, mammals, reptiles and marine life including the 150 estuarine crocodiles. The calm water cruise operates daily through the mangrove ecosystem and this is your chance to see crocodile lurking in the murky waters of the Proserpine River. After the wetlands cruise, you will jump on board the Wetland wagon train tour to explore more of the Goorganga Plains on a tractor drawn wagon. "The calm water cruise operates daily through the mangrove ecosystem and this is your chance to see crocodile lurking in the murky waters of the Proserpine River." Travelling through the wetlands, see Melaleuca forests, mangroves and Australian flora and fauna of North Queensland. To top off the experience you even get to enjoy a traditional Australian bush tucker including damper and billy tea plus an Aussie BBQ lunch and a Lamington cake at a campsite surrounded by Australian bushland. The Whitsundays Crocodile Safari is a truly special experience that is both entertaining and educational for children as they learn more about wildlife and the local history of the area. See a different side to the Whitsundays with an authentic Aussie adventure that runs daily with transfers from Airlie Beach at 8.30am returning at 3pm. Hamilton Island is bursting with adventure for visitors, whether the kids want to take it easy on the beach with a game of beach volleyball or head into the water to experience the reef, they will be sure to find something to keep them occupied. The range of water sports available is amazing! You have the option of taking a trip out to the outskirts of the island to snorkel with sea turtles, go parasailing for a bird’s eye view of the area, jump on a jet ski for an action packed adventure around the island, learn to windsurf take it easy with a kayak. The opportunities are endless! "Hamilton Island is bursting with adventure for visitors, whether the kids want to take it easy on the beach or take a trip out to the outskirts of the island to snorkel with sea turtles, ride jet skis or try stand up paddle boarding." If water sports aren’t your ideal activity, there are plenty of activities on the island itself. You can have a round of mini golf, explore the bush walking trails, play a game of tennis or sign up for a go-kart or quad bike for the kids. Hamilton Island is perfect for thrill seekers or kids wanting to relax on the reef, the whole family will be entertained and preoccupied for the entire trip. Prices depend on the specific activity. Butterfly Bay on Hook Island is a dream destination away from the bustling crowds of the more populated islands. The bay has beautiful bommies all around, but the best of them is located in the middle of the bay. This coral cluster can be reached by snorkelling out from the shore, but swimmers are warned to be wary of the tides and currents and take extra care. Deep water snorkelling isn’t the only option for the children, you can snorkel just off the beach to see the colourful corals and reef fish that populate the area. "Butterfly Bay on Hook Island is a dream destination away from the bustling crowds of the more populated islands." If your kids aren’t confident swimmers or not wanting to snorkel on the reef they can hang around the shoreline in the shade and play in the groups of butterflies that flock to the area. Beautiful colonies of butterflies are known to gather near the mangrove trees and along the creek bed in the shade, hence the name Butterfly Bay. If the young ones fancy a hike, Hook Island also has great walking trails that will take you up to the lookout point for a great view of the reef and some of the islands in the Whitsundays. Airlie Beach Lagoon is the best place for relaxation and fun on the mainland. A popular destination for both locals and tourists, you could spend hours lazing around this man-made beach. There is a designated kids pool at one end, perfect for those little ones who haven’t quite mastered deep water swimming and the main pool is great for the more confident swimmers. "Airlie Beach Lagoon is the best place for relaxation and fun on the mainland. A popular destination for both locals and tourists, you could spend hours lazing around this man-made beach." The lagoon is surrounded by grassy knolls for visitors to spread out and relax, there is also a sandy beach area at one end of the pool. There are also life guards on duty keeping an eye out for all swimmers to ensure everyone is safe. If you’re visiting Airlie Beach, you MUST head to the lagoon for some down time. It is always open and free of charge, making it the best place to kill a few hours before you board your boat to the islands or head back home. If you are looking for a gentle activity and a way for the kids to witness wildlife without having to enter the water or endure an entire day out on a boat then a Turtle eco cruise is an ideal activity for all ages and swimming abilities. Airlie Beach is ideally situated within the Whitsundays and hundreds of turtles can be found in the calm waters surrounding the coastal town if you look hard enough. Turtle Tours operate eco wildlife cruises daily from Abell Point Marina daily and the 45 minute cruises are short enough that children won’t get too antsy or bored. The wildlife rich waters of the Whitsundays are a bounty for nature lovers who will often see more than sea turtles on this gentle water adventure. "Dugongs, spotted eagle rays and dolphins are also commonly spotted on these cruises so keep the camera handy to capture this remarkable experience." Dugongs, spotted eagle rays and dolphins are also commonly spotted on these cruises so keep the camera handy to capture this remarkable experience. Whilst sightings cannot be guaranteed due to the nature of the animals being wild and protected, there are common bays with sea grass that turtles can be found in and your captain and crew will ensure that you see as much wildlife as possible. The short cruise is fun and educational and an activity that both parents and children can enjoy together as you sit and listen to the informative commentary while on board. Cruises are currently operating daily at 1.15pm from the Abell Point Marina and is an activity that won’t break the budget. You could even complete the experience by having brunch or lunch prior to or after the cruise at one of the cafés overlooking the marina and sparkling waters of the bay. Paddle around the waters of Airlie Beach and explore the beautiful shoreline by stand up paddle board. Local company, Whitsunday Stand Up Paddle conducts two sessions a day for those wanting to get out onto the water. No experience? No worries! The experienced team will give you a brief lesson in a safe area next to Able Point Marina highlighting all of the important things you need to know including how to turn, where to stand and how you can control your board and yourself with your paddle. All equipment and lessons are included in the price, all they ask you to bring is a hat, towel and a big smile! The young ones will love paddling around the area as they try to stay dry. It’s a little harder than it looks, but a great challenge for everyone! "Paddle around the waters of Airlie Beach and explore the beautiful shoreline by stand up paddle board." Signing up for a session will also give you free photos, stinger suit hire, sunblock and the paddle board is yours for the whole hour! If balancing on the board is an issue, they also have single and double kayaks for hire. Sessions begin in the morning from 9:30am to 12pm and in the afternoon from 1pm to 3:30pm. Australia's most concentrated slice of island heaven can be found in the Whitsundays, a chain of pristine and beautiful islands off the coast of Queensland that provides visitors with some of the most idyllic and photogenic locations in the entire country. Consisting of 74 individual islands, the Whitsundays offer a cavalcade of marine and shore-based entertainment, with each of its islands bringing something slightly different and unique to the table. The archipelago is a destination that's often used as a showcase of Australia's coastal beauty both domestically and abroad, with its position right amongst the heart of the incredible Great Barrier Reef making for some of the most vivid combinations of natural colours available. Pristine, clear waters, vibrant white beaches and bright and beautiful coral reefs with their fishy inhabitants all make for a spectacular display of nature at its finest. Divided up into several separate sub-groups – including the Whitsunday, Lindeman, Molle and Northern Groups – they offer one of the best getaways in Australia for those seeking a postcard-perfect destination. With multiple popular islands available to the public to choose from – each with its own character and specific activities to offer – there's a dizzying array of choice when planning a trip here. From the incredibly luxurious to the more budget-conscious, the choice of not only which island to visit (or to stay on) but what activities to take part in will likely come down to some combination of your personality and how deep you're willing to reach into your wallet. 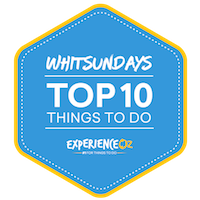 With this in mind, here's our list of the Top 10 Things to do in the Whitsundays. The Great Barrier Reef is always going to be a major highlight for those visiting the Whitsundays, however, given that it can also be explored and enjoyed from such other destinations as Cairns, Port Douglas or Townsville, it's not necessarily an attraction that can't be experienced anywhere else. Thus, position #1 on this list goes to the Whitsundays' most unique and visually impressive calling card that's distinct from any other accessible spot in Australia – Whitsunday Island's spectacular Whitehaven Beach. Considered by many to be the most beautiful beach in the country, Whitehaven is a staple of brochures, posters, and other marketing materials used to promote Aussie natural beauty all over the world, and with good cause – at first glance upon coming into view of Whitehaven Beach, it's easy to think it was something put together in a studio for a magazine shoot; it's simply that perfect. This is not just some tiny little-isolated cove that happens to be ideal either; Whitehaven Beach stretches out over 7 kilometres along Whitsunday Island, meaning that even when travelling during peak times it will rarely be crowded enough to ruin the atmosphere. The myriad of small coves, lagoons and inlets that dot its surrounds only serve to add to the mystique and exploration options, with low tide widely considered the best time for overall sightseeing experiences. You'll often see in brochures for Whitehaven Beach that special care is taken to mention its “white silica sand”, which is all well and good, but to someone who has never visited, what does this actually mean? Silica is a substance that's contained in a very high-purity form of sand, with extremely fine grains that simultaneously make it soft to the touch and also prevent it from getting too hot underfoot. "Whitehaven Beach stretches out over 7 kilometres along Whitsunday Island, meaning that even when travelling during peak times it will rarely be crowded enough to ruin the atmosphere." Coupled with the bleaching effect of the sun, the sand is an almost pure-white colour that forms a wonderful and striking contrast to the vivid blue of the waters that lap at the beach and contributes to the sheer magic of Whitehaven. As the country's most photographed beach, it's also no surprise that Whitehaven Beach is thus the target destination of numerous tour and cruise operators – some of which are mentioned previously on this list – who aim to bring eager guests to catch a glimpse of its offerings. The majority of these depart from the relatively-close-by Airlie Beach, and to get the most out of your trip it's a solid idea to book one of the full-day tours – you'll likely want to spend several hours here, whether it's to take a walk, play some beach volleyball, or simply laze in the sun amongst these unmatched sea-and-sand surroundings. The hike to the lookout point on Hill Inlet is well worth doing, and offers perhaps the best possible spot for getting some incredible photos of the beach and its surrounds, so be sure to allot enough time on your itinerary to do this. Also, bringing along your own supplies is essential unless you have them included as part of a tour – there's no commercialisation or shops here, and thus no food or drink to purchase. With issues such as climate change and overuse possible factors in the deterioration of Whitehaven Beach's perfection in the future, it's highly recommended to pay a visit as soon as you possibly can – Australia's most beautiful beach has certainly earned its reputation, but exactly how long it will last for remains to be seen. While all of the islands of the Whitsundays are spectacular in their own way, the region wouldn't be what it is without all the watery goodness that makes it possible. As one of Australia's true worldwide phenomena and one of Earth's true “natural wonders”, the Great Barrier Reef is – along with #1 on this list below – one of the two core reasons that most people choose to visit the Whitsundays in the first place. Fringing reefs around islands are all well and good and offer convenience in their own way, however in order to experience the reef at its most pure and unadulterated form a trip to its outer reaches is necessary. As the largest and most experienced cruise operator in the Whitsundays region, Cruise Whitsundays provide a proven and comfortable method for getting there, with a pair of reef pontoons moored at Hardy (ReefWorld) and Knuckle Reefs operating as floating “activity platforms”. These pontoons serve as fully-fledged bases of operation with the luxury of being surrounded by pure reef – it's an interesting contrast of environments as all the conveniences you'll need such as seating, tables, shade and showers are here coexisting right alongside a true natural showcase, but it's both convenient and it works. Once you've arrived, the range of things to see and do here is amazing regardless of if you're a non-swimmer or a more seasoned snorkeller. As a starting point, the pontoons come equipped with underwater viewing chambers that make for a great taste of things to come and the ability to stare directly into the life-filled waters (it's even possible to dine here – likely to be a place for a meal unlike you've ever had before). The next logical step is then the semi-submersible rides that take you out into the water and are ideal for those who aren't confident in the water, and also great for kids - who will literally be able to “find Nemo” here as the waters are renowned for their populations of Clownfish. "As one of Australia's true worldwide phenomena and one of Earth's true “natural wonders”, the Great Barrier Reef is one of the core reasons that most people choose to visit the Whitsundays in the first place." Those looking to actually hit the water will be able to take part in some of the best snorkelling that the accessible parts of the Great Barrier Reef have to offer, and the setups here off the pontoon are great for those who aren't expert swimmers – the snorkelling section utilises a rope system providing hand-holds in the water and floating rest stops that prevent you from needing to permanently swim or tread water. There is a section of the snorkelling area at the pontoon's rear where the staff do the fish feeding, which allows for some amazing viewing as hundreds of fish flock to get a bite to eat. Thousands of colourful fish of all sizes can be seen nestled amongst the coral here, and given that the majority of them tend to congregate near the surface, you won't need to go scuba diving to get a varied and impressive dose of marine life – reef favourites such as angelfish, surgeonfish, starfish and much more are all staples here. Cruises out to the reef platforms are conducted via large reef catamarans that make for an optimal balance of size/space and speed, with the trip out itself being quite spectacular. Given the length of the journey to the Outer Reef (expect around a 2.5 hour one-way trip from the departure point at Airlie Beach) however, the trip can sometimes be a bumpy ride over open ocean, and seasickness can sometimes be a factor – it's thus advisable to ensure you bring along anti-seasick pills for the ride. All equipment such as snorkelling gear, wetsuits and life jackets are provided, while lunches are also included as part of the deal in buffet form consisting of fresh meats and salads, which makes for a good excuse to take a break and recharge for more marine fun in the afternoon. It's highly recommended to bring along an underwater camera – they are available for increasingly cheap prices nowadays, particularly if you purchase a disposable one – to grab some snapshots while you're snorkelling. In all, while it requires an increased combination of time investment and money over some simple island snorkelling, if you're looking to get the most out of your reef experience an Outer Reef trip is more than worth it. Gaining a full level of appreciation for the many colours, shapes and sheer scale of the Great Barrier Reef and its islands is not easy to do in the course of a single holiday, however when viewed from a few hundred metres above the ground this incredible panorama takes on a whole new life. It's here that local operator Air Whitsundays come in, providing some truly epic adventures above some of the most recognisable and iconic parts of the region – many of the best shots you've likely seen in promotional material showing off the Whitsundays' beauty have been captured on flights just like these. The amazing juxtaposition of greens and blues on display from high above is truly incredible and depending on your choice of flights you'll be able to gain a look at some famous white beaches as well. Having been in operation for over 40 years, Air Whitsunday has a fleet of light aircraft that takes lucky travellers on an intimate journey to view some spots that are inaccessible by boat and also have the added benefit of getting guests further out on the reef at a faster pace than water-borne vessels. Picture-perfect spots such as the oft-romanticised Heart Reef, luxurious Hayman Island, and incredible Whitehaven Beach are obvious highlights, while the angle granted by being airborne provides an awe-inspiring spectacle that you'll almost certainly want to capture via a proper camera; smartphones simply don't do the view justice. The combination of coral cays, marine life, fringing reefs and much more will be something you'll want to look back on in years to come! "Picture-perfect spots such as the oft-romanticised Heart Reef, luxurious Hayman Island, and incredible Whitehaven Beach are obvious highlights, while the angle granted by being airborne provides an awe-inspiring spectacle." Pilots here have a vast degree of knowledge and experience to pull from and are familiar not only with all the natural highlights but also providing flight paths that provide customers with the best possible view of each. During the tours, you'll have the option to perform water landings and then transfer onto glass-bottom boat vessels for a firsthand look directly into the water, as well as go snorkelling (typically at Hardy Reef) which makes for a great air-and-water combined experience. In addition, the Whitehaven Beach itinerary is one of the best ways to experience this stunning stretch of sand, as you'll be taken to a secluded area of the beach away from more crowded sections, which in turn offers a quieter atmosphere that makes one of the most beautiful parts of Australia even more special. Throw in the ability to land in the water which helps separate the experience from other scenic flight options, and it's something that's hard to match. Tours with Air Whitsunday depart from a terminal on Shute Harbour Road around 10 minutes drive out of the centre of Airlie Beach, while private charters are also available that allow for more personalised itineraries – and, incidentally, one of the most memorable spots for a marriage proposal in the country (hint, hint guys). While scenic flights can be pricey, if you're only going to be making the trip to the Whitsundays once, it's well worth biting the bullet and paying for an experience that many often cite as the most unforgettable part of their trip to the region. Looking for a speedy, and efficient water-borne way to do a tour of the Whitsundays' highlights for groups that manages to simultaneously be scenic and exhilarating? A high-speed trip out on the water with Ocean Rafting should do the trick. Featuring inflatable vessels that put a focus on fun and pack a powerful punch to boot, their lightweight construction couples with a 450hp engine to make for a thrilling way to zip through these pristine waters. The tours here aim to emphasise some of the less-commercialised aspects of the Whitsundays, with a detailed look at some of its uninhabited areas that are teeming with local wildlife both on land and in the water. The speed of the ocean rafts means that within the allotted tour time you'll cover a fairly substantial chunk of the Whitsundays as they wind their way in and out of the various bodies of water. Where you'll go on the journey depends on which itinerary select – guests are given a choice of two different tours, one which focuses on the water and the other which allocates more time to the beach. Both tours pay a visit to spectacular Whitehaven Beach on Whitsunday Island, and as the only tour with access to Hill Inlet beach, it's a trip that ensures the only crowds you face will be the maximum 25-person numbers of your fellow tour travellers. After landing on the beach you'll have plenty of time to feel the iconic silica sand on your feet and take a walk up to the top of Hill Inlet Lookout for one of the Whitsundays most spectacular vantage points. "After landing on the beach you'll have plenty of time to feel the iconic silica sand on your feet and take a walk up to the top of Hill Inlet Lookout for one of the Whitsundays most spectacular vantage points." If you're looking to spend more time on the beach itself, the “Southern Lights” itinerary is the one for you – however if the aquatic activity is your primary focus, the “Northern Exposure” option provides more time for snorkelling, with two separate stops for snorkelling. The first of these snorkel stops tend to have a larger quantity of fish – albeit with less variety – while the second has fewer, larger fish with sea turtles that can often be encountered as well. Regardless of if you're primarily looking to get up close with the fish or lounge on the beach, both itineraries will have you amongst a stunning backdrop. Staff here are friendly, funny and enthusiastic, and unlike with many other tours that don't offer a choice, guests are welcome to bring along their own food and drink for some additional savings – although a quality lunch is available for a reasonable $15 addon. There are few tour options available in the Whitsundays in which the journey itself is one of the main parts of the adventure rather than just the destination, but the jet-boat-esque rush within this wonderful area is just that. Add it to the joys of snorkelling or beach exploration and it's a double-dose of sightseeing pleasure. Have you ever wanted to sleep on the Great Barrier Reef under the stars? Well, you can make this dream come true on an overnight cruise to the permanently moored “Reefworld” on Hardly Reef in the Whitsundays. This is one of those more unique travel experiences with the chance to explore marine life above and below the water’s surface, however, it is the opportunity to view a sunrise and sunset over the Great Barrier plus undisturbed stargazing that makes this a once in a lifetime Great Barrier Reef experience. The overnight cruise departs daily from the new Port of Airlie marina or Hamilton Island to enjoy a change of scenery and 2 days and 1 night on the Great Barrier Reef. Travel on a comfortable, high speed catamaran which effortlessly navigates the seas of the Outer Great Barrier Reef. Passengers will travel out to the reef platform with the day cruise visitors to swim, snorkel and dive the Great Barrier Reef. The outer reef platform is situated in a picturesque part of the Great Barrier Reef not far from the famous ‘Heart Reef’. Choose from a range of activities including a scenic flight over Heart Reef, take part in glass bottom boat rides and scuba dives or simply sit in the underwater observatory and be mesmerised by the colourful fish that swim on by. "The outer reef platform is situated in a picturesque part of the Great Barrier Reef near the famous ‘Heart Reef’. Choose from a range of activities including scenic flights over Heart Reef, glass bottom boat rides, scuba dives or simply sit in the underwater observatory and be mesmerised by the colourful fish that swim on by." In the afternoon, wave goodbye to the day visitors and rejoice at having the run of the reef platform with a maximum of 30 passengers allowed on the overnight experience which makes for a more intimate and personal experience. Make the most of the lack of crowds and hit the waters again for additional snorkelling and dives or enjoy a drink waiting for the sunset. Certified divers can take advantage of a night dive and see how much the reef changes at night when the reef predators come out hunting out their prey. Non-divers can get stuck into a delicious gourmet dinner of steak, ravioli, lamb shank, curry or seafood platters and revel in the quietness of the reef at night. Swags are the accommodation of choice for the night which incredibly have a viewing panel so you can fall asleep gazing up at the stars and then wake up to a reef sunrise. The second day of the reef means more time spent snorkelling or diving the coral reef gardens with personal encounters with marine life before you head home in the afternoon with the remaining day guests. This is a great option for those looking for an immersive and unique Great Barrier Reef experience with the most amount of time snorkelling and diving on the reef plus the chance for night dives, sunsets and stargazing. The flagship and most famous island in the Whitsundays, Hamilton is easy to recommend as one of the best all-round offerings in the chain with a diverse array of accommodation and activity choices available for visitors. It's also the largest developed, and thus one of the most well-equipped, islands in the Whitsundays in terms of facilities, with plenty of shopping, restaurants and even its own commercial airport. As such, if you're the type of traveller looking for a “resort style” location for your trip that offers plenty of chances for pampering, dining and activities and don't mind sharing all these benefits with other people, then Hamilton Island ticks all the boxes – and then some. While it's seen increasing development over the years, Hamilton Island is still largely untouched by human hands, with only 33% of the island having been commercialised. It's thus one of the most interesting examples of ultra-modern architectural development in Australia, as the luxurious man-made constructions still manage to strike a solid balance with the island's natural beauty. As such, it's a place that boasts plenty of facilities aimed at high-end recreation – Hamilton has a world-class golf club, an architecturally-interesting Yacht Club, and a range of luxurious resorts for those looking to splash out on their accommodation. It's also a lively and event-filled spot that has all the benefits of modern convenience, and as such it is perhaps the best choice of islands in the Whitsundays for those travelling as a family. "It's one of the most interesting examples of ultra-modern architectural development in Australia, as the luxurious man-made constructions still manage to strike a solid balance with the island's natural beauty." Aside from the aforementioned WILD LIFE Hamilton Island, there are two main pools available for public use so that children can enjoy the water that are both right on the beach and thus easy to access, mini-golf set amongst a maze of plants and palms, a purpose-built go-kart track, kids quad bikes and much more. Adults, meanwhile will be spoiled for choice in terms of on-island activities and will largely depend on which side of the island you're staying on – one contains the majority of the resorts and thus tends to be quieter and more laid-back, while the other serves as the hub for most of the shopping and restaurants. Indulge in some pampering at a day spa, take a bushwalk through the winding tracks to sandy coves or lookout points, play golf or tennis – the choices are nearly endless. Given Hamilton Island's expansive size, getting from one side to the other can take a fair amount of effort, and thus hiring a golf buggy to zip around the island can be a life-saver; fortunately, many of the accommodation options on offer include this as part of their packages. Looking to the water, meanwhile, and Hamilton doesn't disappoint either – the fringing reef that surrounds the island is one of its main drawcards for some light snorkelling, with plentiful colourful fish that are unusually tame and have become used to interacting with humans. Kayaks and jet skis are also available for hire for those looking to explore the water further. If you're looking for a full-blown Great Barrier Reef experience you'll have to be prepared to invest a significant amount of time, as popular spots such as the Reef World pontoon involve a longer journey of around 2 hours each way, while trips to iconic Whitehaven Beach (mentioned elsewhere on this list) are also a viable choice. If you're after options and diversity when visiting the Whitsundays, then few other places can compare to basing yourself on Hamilton Island – it's got a smorgasbord of ways to spend your time. On the opposite end of the water-exploration spectrum, kicking back and enjoying the atmosphere of a sailing boat is one of the more luxurious or adventurous ways to take in the spectacular Whitsundays environment – one that Whitsunday Sailing Adventures provide to the fullest. Featuring a cavalcade of itineraries, vessel types and sizes and budget ranges, if you're looking to indulge with a high-end yet laid-back cruise experience that can span anywhere from half a day to a one-week epic, they've got an itinerary on offer to suit. A number of different islands and island environments are also available, allowing for a degree of customisation that helps ensure that any adventure you choose to make can be truly your own. Not exactly sure where you want to go? They'll be able to advice the best itinerary whether your priority is snorkelling, diving, romance or something in-between. Depending on your choice of tour plan, you'll have the chance to visit all the major highlights of the region, as well as take part in a range of activities that use the boat as a launching pad from which to enjoy them. "Depending on your choice of tour plan, you'll have the chance to visit all the major highlights of the region, as well as take part in a range of activities that use the boat as a launching pad from which to enjoy them." The likes of kayaking through mangrove-laden “water-forests”, diving amongst pristine corals and doing some top-notch snorkelling - the crews of this long-running company are familiar with all the best snorkel sites and the most efficient ways to get to them – are supplemented by the inherent beauty of the region as a whole. These are relaxed trips that are a far cry from the “party boat” style atmosphere available on different tours, so if you're looking for that type of cruise you may want to look elsewhere. It's the multi-day trips that truly shine here, as staying on board a vessel you get to witness all the aspects of the Whitsundays from dawn until dusk, and the effect of both the rising and setting sun casting its glow across such a stunning island environment is one that's bound to be remembered. All the necessary supplies for a multi-day liveaboard trip are included on their itineraries, and as such guests only need to take long the minimum amount of equipment – a change of clothes, sunscreen and a towel (and seasickness pills if you're of a weaker stomach) and you'll be set, as everything else is provided – with cooking done on board. While it's difficult to go into detail on all the available trip options in this space, the friendliness, care and experience of the crew coupled with the sheer amount of choice in itineraries makes this the ideal choice for commemorating a special occasion in the Whitsundays. Those wanting a more upbeat and hands-on approach to their Whitsundays cruise / tours experience can kick things up a notch by heading out on the open water with local operator Whitsunday Jetski Tours, who specialise in catering for the more adventurous traveller. Featuring a pair of tour itineraries that head at high-speed to different parts of the Whitsundays, it's an exciting and fun way to explore some of the amazing coastal and island highlights while taking control of your own vehicle. In many ways, this provides the best of both worlds – you get all the sightseeing of your standard cruise tour, but also a dose of adrenaline and physicality, ticking two boxes at once for a single one-off price. There's something about the feeling of freedom that exploring blue, open sees that's purely exhilarating, and the skis are designed to deal with bumpier conditions, which ensure that the experience can still be fun even when it's choppy on the water. "There's something about the feeling of freedom that exploring blue, open sees that's purely exhilarating, and the skis are designed to deal with bumpier conditions, which ensure that the experience can still be fun even when it's choppy on the water." The Whitsunday Jetski Tours team is friendly, fun and energetic, yet still patient enough to deal with nervous or inexperienced riders who may not be too confident in the water, or should they fall of their ski – safety is taken seriously here, and guests are given a full safety briefing as well as quality life jackets before heading out. Your choice of their available jet ski tours will vary based on two factors – how adventurous your temperament is and how long you're looking to spend on the water. The morning Airlie tour is slightly more laid-back and showcases the best of Airlie Beach and its neighbouring Pioneer Bay, a particularly marine-life-rich stretch of water that's nicknamed the “Turtle Tour” due to the large number of sea turtles which can be found in the water. It's not uncommon to spot anywhere between 10 and 20 sea turtles on each trip! The afternoon “Daydream Extreme” itinerary, meanwhile is more adventurous, lasting for 4 hours and heading out to more open waters for a visit to a deserted offshore island before ending up at Daydream island for lunch and use of the facilities at Daydream Island Resort. Throw in a bunch of thoughtful extras included such as bottled water (a necessity to wash out the salt taste you'll no doubt end up with), courtesy photos taken for you during the tour that provide a great way to commemorate the experience, and return accommodation pickups/drop offs and you've got a comprehensive and fast-paced way to see some great Whitsundays highlights in a fun, lighthearted and more daring manner than your average relaxed cruise itinerary. Set sail on board Providence V for a relaxing sunset cruise in Pioneer Bay, Whitsundays. With a complimentary glass of champagne in hand and nibbles served on deck, find your position to watch a Whitsunday sunset in style. Experience classic sailing on Providence V- a 62 ft gaff-ridded schooner- and mingle with fellow passengers sharing your travel stories. "Experience classic sailing on Providence V- a 62 ft gaff-ridded schooner- and mingle with fellow passengers sharing your travel stories." A cruise like this is the perfect way to unwind and take in the islands and scenic bays of the Whitsundays as the sunsets and then sail back into Airlie Beach under the stars. The 2 hour sunset sail cruise run three times a week on Tuesdays, Fridays and Saturdays from 5pm to 7pm from the Abell Point Marina. If you are looking for a memorable Whitsunday experience, the sunset cruise is one relaxing activity that pleases everybody which is why it makes our top 10 things to do in The Whitsundays. After the sunset cruise, why not wander down The Esplanade in search of a delicious dinner to complete the evening. If you are thinking about taking the ultimate leap of faith to experience skydiving then why not do it over a picturesque location with incredible aerial views? Skydiving is available in the Whitsundays from the mainland in Airlie Beach and with two companies in operation there is choice from which height that you can jump from. Choose a 7, 000 ft or 15, 000 ft tandem skydive with Skydive Airlie Beach or a 10, 000 ft and 14, 000 ft skydive with Airlie Beach Skydivers for a once in a lifetime experience that will leave you feeling invincible. The reward for a brave few is breathtaking views (literally) of the 74 Whitsunday Islands that lie in the heart of the Great Barrier Reef. See the golden shores of sandy islands and sparkling blue waters contrasted with the lush greenery of the mountainous terrain that make up The Whitsunday Islands. "See the golden shores of the sandy islands and sparkling waters contrasted with the lush greenery of the mountainous terrain below that make up The Whitsunday Islands. " Aerial views, whether from the safety of a scenic flight or a more adrenaline pumping skydive are the best way to understand and appreciate the beauty of the islands and individual coral reefs that lie off the Queensland coastline. Marine life can often be spotted from the air too including rays, large schools of tropical fish or even whales during their migration season. For those chasing an adrenaline rush, it doesn’t get better than a skydive with a free fall at speeds of 200 km/ hour. The length of the free fall time in the air will depend on the elevation you choose to jump from, however, all skydivers will love the 5-7 minute flight back to down earth when the parachute is released and you can stop, take a breather and soak in the amazing views. Best of all, you can purchase videos and photos to share the experience (and show off) with your friends and family to make those memories last a lifetime. If you are ready to tick that item off your bucket list and skydive over The Whitsundays then you can view a selection of operators below who offer this mind blowing experience.